Your comments and suggestions are welcome. 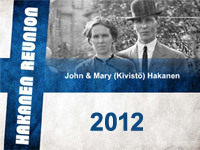 Many distant relatives have contacted us through the web site. Some who also do genealogy research. Much of their information has been invaluable to us. wes.hakanen[at]verizon.net (replace [at] with @) Thank you.